People use maps not only to represent the geography of places, but also to tell stories about those places. A map can instantly convey clear messages about geography, culture, and society. Advances in technology over the past three decades have given rise to a scientific tool called a Geographic Information System (GIS). GIS computer programs capture, store, analyze, and display cartographic data. Using GIS, information stored in a database can be displayed as a map or represented as statistical tables. Today, many fields, from criminology to public health to history, are finding GIS to be an invaluable tool. GIS can be used to track changes in places over time. 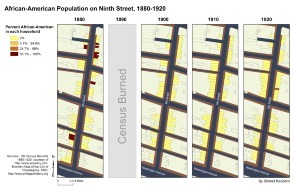 I have used it to develop maps that help tell the story of the emergence of the Ninth Street Market during the 40 year period from 1880 to 1920. Demographic attributes such as age, gender, and occupation reveal the changing characteristics of the area's residents during this period. 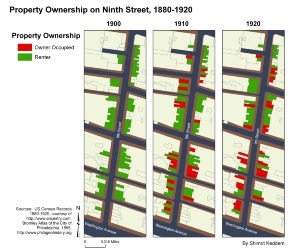 Maps of property ownership and land use trace the establishment of businesses on Ninth Street and the formation of a commercial district. To examine these demographic and ownership patterns, I collected records on individuals from the decennial federal censuses of 1880, 1900, 1910, and 1920. These records include each person's place of birth as well as his or her father's and mother's places of birth. I created a database to track the ancestry of each individual living on Ninth Street between Christian and Washington during these years. Insurance maps are one of the most extensive sources of data on historic land use. They contain detailed city plans and include descriptions of building footprints, building materials, locations of doors, and the type of use for each property. 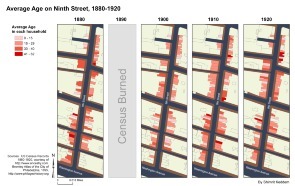 In Philadelphia, a variety of fire insurance maps are available from different companies. For this project, I used maps from the surveys of Ernest Hexamer and Son, Inc., available for 1888, 1895, 1909, and 1916. Adding to my database, I recorded each property's land use on Ninth Street between Christian and Washington streets. In order to display this historic information on a map, I created a digital image of these properties by first importing a scanned portion of the Bromley Atlas of Philadelphia (1895) into the GIS software, then tracing each Ninth Street property between Christian and Washington. I altered the resulting digitized map slightly to ensure that it matched the Hexamer records for each of the relevant years, adding new buildings as they were built. Finally, I linked the information about the people and the businesses to this map of properties on Ninth Street. 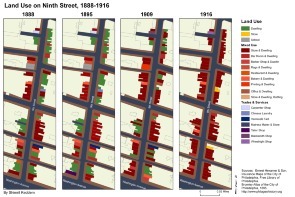 These maps tell the story of a major period of transition in Philadelphia. 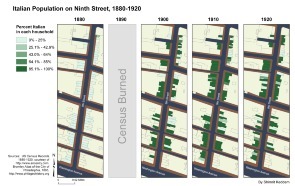 Maps reveal how rapid changes in population along Ninth Street between 1880 and 1920 changed a primarily Irish and German residential neighborhood into an almost entirely Italian commercial district. The Russian Jewish population also increased substantially by 1920, while African Americans left the area by 1900. 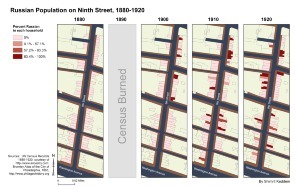 The maps show this transformation by visually recounting the tale of this neighborhood, allowing us to see fundamental changes over time that not only impacted South Philadelphia but reflected broader historical developments and trends. Shimrit Keddem works at the University of Pennsylvania as a data analyst, where she recently completed a masters of urban spatial analytics, applying geographic analysis techniques to urban issues, demography, and public health. 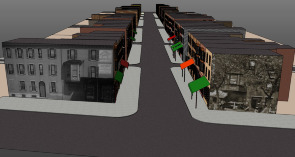 Her project on the Ninth Street Market is part of the partnership between HSP's PhilaPlace project and the University of Pennsylvania School of Design.